Monica Tattoos the Tattoo Studio in Bangalore run by Radha a Female Tattoo Artist in Bangalore. 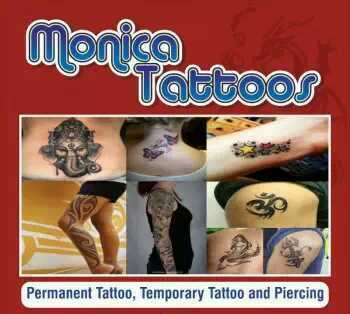 Monica Tattoos Proprietor Radha is a Female Tattoo Artist in Bangalore carving beautiful Tattoos since the past 2 Years. She has done the Tattoo Art for many customers in Bangalore. Monica Tattoos is the place to find the Female Tattoo Artist in Bangalore where the tattoos are done exclusively for Females, Ladies & Children. Radha the Female Tattoo Artist in Bangalore is specialised in Body Art, Tattoo Designs, Colour Tattoos, Tattoo Art and serving the customers of Bangalore though her Tattoo Studio located in the heart of the Bangalore City.